Every time a new member signs up, we will donate a FREE membership to a Best Friends adopted animal. Best Friends is America's largest animal sanctuary. Our customers typically save close to $200/yr when purchasing preventatives as members of PetPlus. PetPlus is a membership plan that gives you wholesale pricing on preventatives, supplements and speciality foods. With Free Shipping always, no minimums. 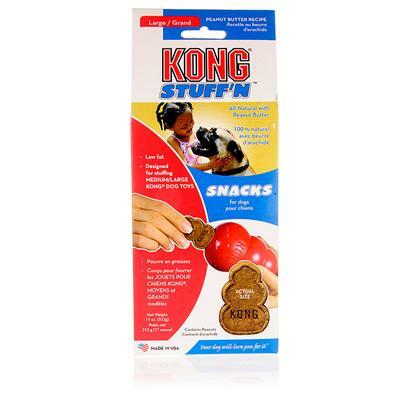 If you have loved Kong toys, you would know that they'd become more fun with treats stuffed within them. Kong Peanut Butter Stuff N' Snaps is the ideal stuffing for all sizes of Kong toys. Unbleached flour, whole wheat flour, black strap molasses, soy oil, rolled oats, natural caramel color, egg powder, nonfat dry milk, salt, baking soda, natural peanut butter flavor, brewers yeast. PetPlus is on a mission to help you manage you pet’s care and give back to the pet community. PetPlus is not a pharmacy. PetPlus partners with National Association of Boards of Pharmacy (NABP) accredited pharmacies such as CVS, Walgreens, RiteAid and PetCareRx to fulfill your prescriptions. Prescription orders dispensed through online mail-order will be directed to PetCareRx. PetPlus is not a pharmacy. PetPlus partners with National Association of Boards of Pharmacy (NABP) accredited pharmacies such as CVS, Walgreens, RiteAid and PetCareRx to fulfill your prescriptions. Prescription orders dispensed through online mail-order will be directed to PetCareRx, and those through in-store pickup will be dispensed at the local Caremark network pharmacy chosen by the customer. *If by the end of a 1-year membership, you have not achieved total savings on all eligible purchases and services with the PetPlus plan that is equal to or greater than the membership fee, you are eligible for credit equal to the difference between the membership fee and your total savings. See further detail in our Terms and Conditions. PetPlus works hard to make it easier for you to take care of your pet, and we don't want you to worry about costs. If you find a better price for a prescription or preventative medicine from a U.S. licensed, Vet-VIPPS verified online pharmacy, we will do everything possible to meet or beat that price. Please call us at 1-866-893-0306 to speak with a customer care representative. ©2019 PetPlus. All Rights Reserved.
' + linky; // return $("
Bring your prescription and PetPlus membership card to the pharmacy and have it filled right there! Don't have your member card yet? Bring your prescription and PetPlus membership card to the pharmacy and have it filled right there!